ETRdotTV ThunderWAN Subscribers can now seamlessly connect at Cookstown Pub in Innisfil Ontario! 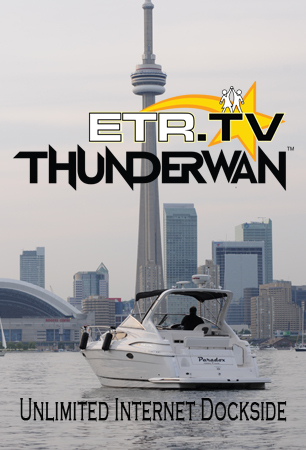 Available now at Toronto Island Marina, ETRdotTV ThunderWAN lets boaters enjoy great Internet service while on their boats dockside, or almost anywhere in the marina. Utilizing a digital link across the harbour to a commercial datacentre, ETRdotTV ThunderWAN enjoys almost unlimited Internet connectivity. We peer with providers like Cogent, Beanfield, AT&T, Comcast, Cogeco, Rogers, Telus, Bell and others. Service is 24x7 and is provisioned for 10Mb/s both upload and download speed. Data transfer is UNLIMITED so you can stream away. We support most Windows, iOS, and Android devices with a standard account. You may have up to 3 devices with the standard account. Security is provided by our RADIUS authentication server using Enterprise grade logins with unique usernames and passwords for every user. We can optionally also support non-enterprise devices such as smart TVs, game consoles and smart speakers. There are currently no activation charges or winter account maintenance fees - no surprises, simple pricing! Sign up now for a FREE Trial. No credit card required.